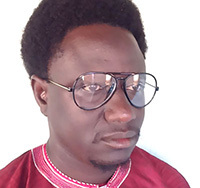 Mamadou Edrisa Njie is an international journalist social justice activist always eager to share his ideas with others and to get theirs in return. Some of his writing samples are posted on his blog, Mansabanko and The Daily News. He is the founder of the Global Youth Innovation Network Gambia chapter and editorial assistant and newsroom coordinator at The Gambia News and Report Weekly Magazine. He is also a GYIN and One Young World Ambassador. Engaged idealist, he wrote numerous articles about the environment, press freedom, youth matters, women empowerment, social justice, and the African continent in English. Mr. Njie is an alumna of the International Institute for Journalism – Germany and studied Mass Communication at the Institute of Professional Administration and Management. Njie is a motivational speaker, coach and serves as a mentor to many young Gambian especially young journalists. He represents his country in numerous trainings, seminars, conferences both nationally and internationally. The Young Volunteers for the Environment. The Gambia ‘ Clean Energy for Africa 2012 Activities ‘. The Young Journalists Association of The Gambia.